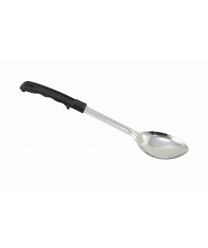 Function and ease-of-use combine in the Winco BHOP-13 Solid Basting Spoon with Stop Hook, 13". This durable stainless steel spoon is non-perforated, so it is perfect for spooning rich pan juices over meat, poultry, potatoes and more. The Bakelite handle of this basting spoon is designed for easy and comfortable gripping, and it features a stop hook, which prevents the spoon from slipping into the pan, bowl or container.